Who Won the Arlen Ness Customized 2014 Victory Cross Country? 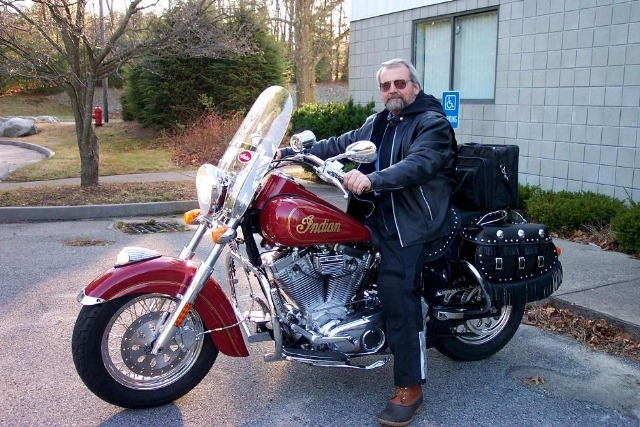 The 2013 Victory winner, Sid Martsen of Lawrence, Massachusetts, sitting on his 2003 Indian Spirit. Every year since 2002 the National Motorcycle Museum has encouraged its supporters to donate for a chance to win a great new or restored antique motorcycle. This annual program is the Museum’s biggest, most important fundraising program. For 2013 a Victory Cross Country, Donated by Victory Motorcycle and customized by Arlen Ness was the big prize. On the afternoon of December 31, 2013 the lucky ticket bought by Sid Martsen of Lawrence, Massachusetts. A ticket bought by Sid Martsen of Lawrence, Massachusetts was drawn! We called Sid and let him know of his winnings. As it has been for previous 12 winners, Sid was extremely excited when Museum Director Jeff Carstensen called him to give the good news. Sid is a seasoned rider. His first bike was a German Triumph TRW, a bike not related to the British Triumph. And he’s had a BSA Lightning, also a couple of Moto Guzzi Eldorados, the big Italian touring bikes from the 1960’s. His most recent bike is a 2003 Indian Spirit, one of the bikes developed by Indian while based in Gilroy, California. He also owned for 45 years a very early Franklin automobile, air-cooled! Sid is a Museum member, has been since 2008, and has always donated for chances to win. This year he responded to the mailing and went for six chances on the Victory, and says he will continue to support the National Motorcycle Museum in the future. The Museum is grateful to all its fundraiser bike program sponsors; Victory Motorcycle, J&P Cycles and American Iron Magazine. We thank all of you we met at events through the past year and those who donated for a chance to win the Victory Cross Country on the Museum website. Donations for a chance to win the Museum’s annual fundraiser bike add up to the Museum’s greatest means of support. Without these donations the Museum cannot continue to create new exhibits, keep displays fresh and interesting for your next visit.